Our general climbing sessions are perfect for a fun filled day out or energy burning activity for kids and adults, aged 4 and upwards. No climbing experience is necessary, full training is given and we provide the equipment! Members of staff clip climbers onto walls with carabiners and our automatic belay devices take in the slack as you climb and then lower you gently to the ground. Supervisors are close at hand at all times. With 21 individual and multi climber wall challenges of varying design and difficulty, Clip ‘n Climb is a great place to test agility and courage in different ways! We also have 3 special attractions – the infamous Vertical Drop Slide, Leap of Faith and Stairway to Heaven! When you’ve done the school run, the weather is against you and your toddler is bouncing off the walls, an indoor play area where they can explore in a fun, safe and stimulating environment is just what they need. Every Monday to Friday 10.15am-11.30am during term time at Clip ‘n Climb Chelsea - London’s popular all-weather indoor climbing centre, are launching brand new sessions for the climbers of tomorrow! This session offers an introduction to climbing for dare devil toddlers during Clip ‘n Climb Chelsea’s off-peak quieter period, giving toddlers the time and space to find their feet, encouraged and not made to feel intimated by older climbers. These sessions also offer specific sensory facilities allowing children to play and learn together. The new toddler climbing sessions are suitable for children 2 – 4 years old and has a weight restriction of 12kilos and above. 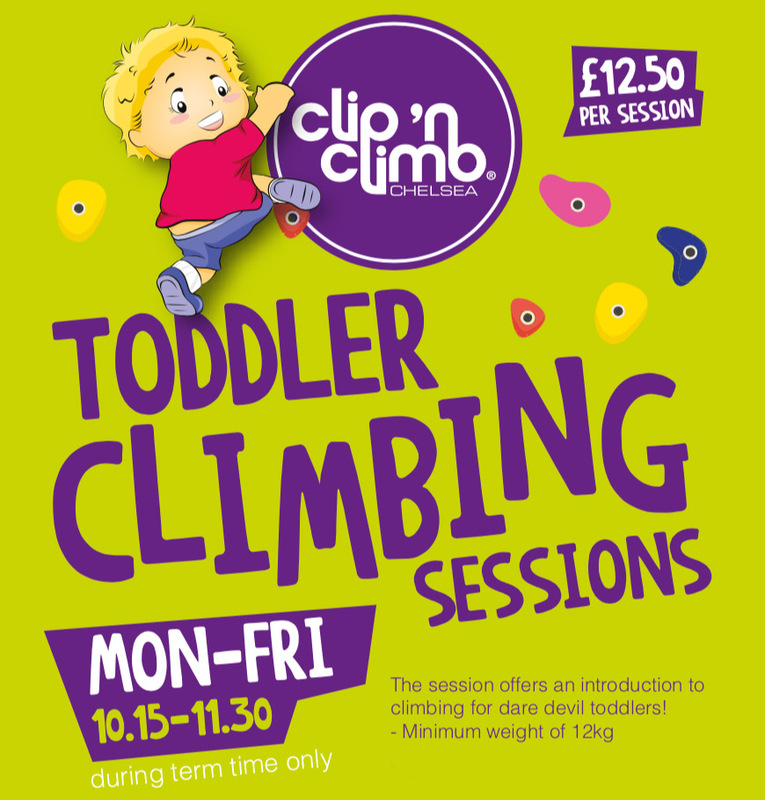 Clip ‘n Climb Chelsea staff will be on hand to encourage toddlers throughout their session, however it is important that a parent or guardian is also present with their child at all times, inside the main climbing arena. With our party option, for up to 35 people, if you plan to bring or serve any of your own food (birthday cakes included) to Clip ‘n Climb Chelsea you will also need to book the party room in our café. A popular choice with many parents is to order pizzas from a local company that we can put you in contact with. Take a look at the following information to help you decide which is the right option for you. Please call us on 020 7736 2271 or email [email protected] for any questions about our standard party options or to make a booking. For bespoke parties, please email [email protected] and our Events Manager, Jo Whittaker, will contact you to discuss requirements and pricing. Please contact us to find out what we could include in your bespoke party! HOW DOES PARTY ROOM HIRE WORK? Clip ‘n Climb Chelsea is creating opportunities for more children and young people to take part in a challenging, exciting and rewarding activity. We aim to help children and young people of all ages and abilities have access to an exercise programme that is fun, friendly and promotes an inclusive environment. The government has invested £450m into the improvement of the PE & Sport provision in primary schools, with funding allocated directly to head teachers. We also welcome the opportunity to work with schools on fundraising events or reward schemes. Sessions are one hour long and we can accommodate up to 30 children in the arena. The children have had a fantastic time this term and the session leaders are amazing – we’ll be back next term! I look forward to coming here each week, my time on the leader board has got better and better – my favourite wall is the Aliens wall! A parent approached us to ask us to look into sessions with Clip ‘N Climb Chelsea, as their child went regularly and got so much out of it. We’re really pleased we did as the team are great and the children have really progressed over the term – many thanks!